10 Little Rubber Ducks is one of our favorite Eric Carle books, partially due to the colorful, perky illustrations and partially due to the fact that the story is based on an actual cargo ship accident that set 29,000 plastic ducks, turtles and frogs adrift in the ocean.Eric Carle's version scales the spill down to a more 'manageable' ten duckies adrift. 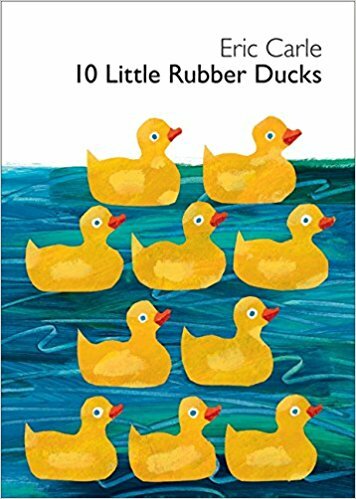 10 Little Rubber Ducks tells their story from production in a factory to 10 of them falling into the sea during a storm, seeing different oceanic sites, and finally ding their way to a different location. 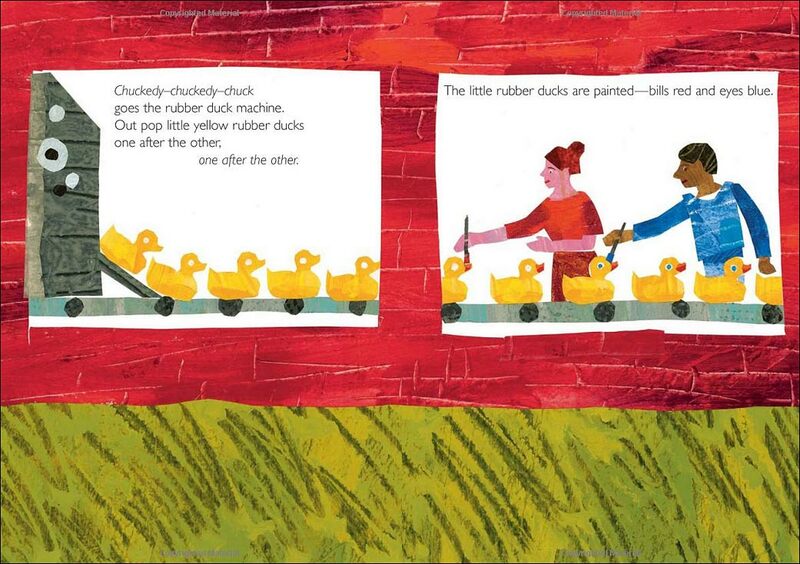 Ordinal numbers (shown as "1st" as opposed to "first") are used for each duck and printed in bold, making it a great resource for teaching ordinal numbers. School Library Journal called it "a definite 10." We agree. It's adorable and kids love it. 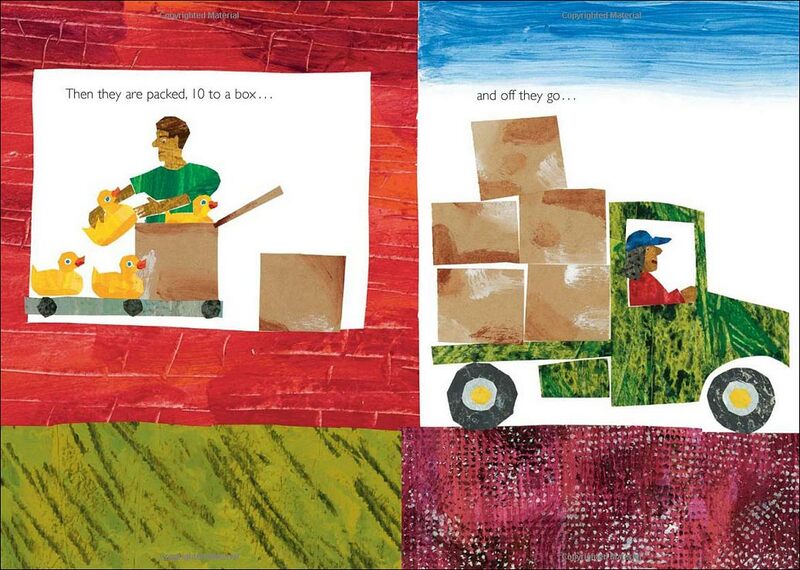 It's hard to go wrong with Eric Carle! Below are the first three spreads, just to give you an idea of the illustrations---although who isn't already familiar with Carle's stunning collages. 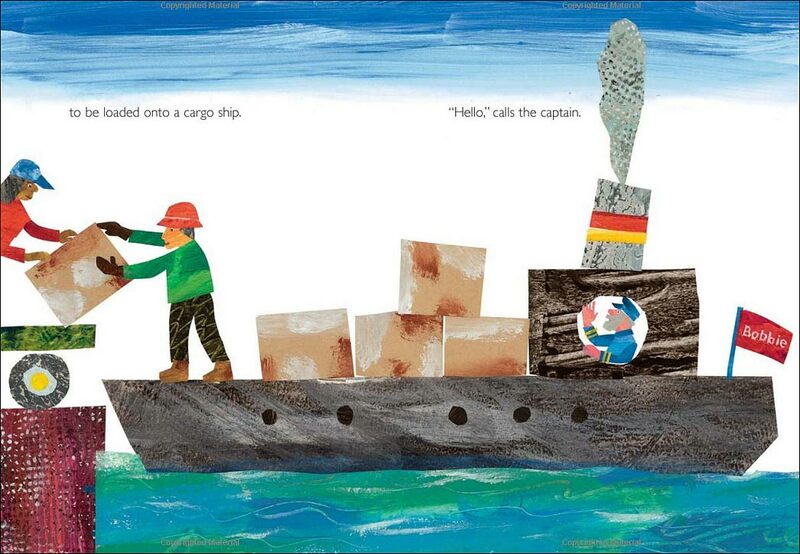 This takes place at the beginning of the book, when the little ducks are being loaded onto the cargo ship. Kids love hearing the real story that inspired Eric Carle to write this book. The idea of thousands of little rubber ducks (along with other bathtub toys like beavers, turtles and frogs) floating out at sea for a decade and finally washing up on the shores of New England is almost unbelievable! For the specifics of the story to share with your class, click here.